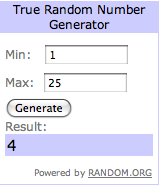 ... lucky number 4. Paula from Two Ellie is the winner of the cuff! Paula, email me your address and I'll pop it in the mail for you this week! Congrats.